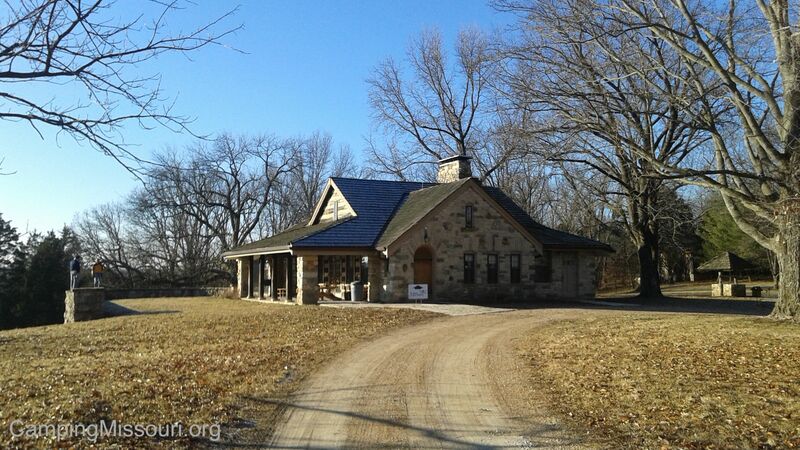 The Adlyne Freund Center, at Shaw Nature Reserve. Ready for a relaxing stroll through the woods? And it all started out so harmlessly. A group of 25 or so eager volunteers met at the Adlyne Freund Center, on the east side of SNR. It was about 9 am, with the sun just above the hills in the distance, burning off the cool mist rising from the river valley. 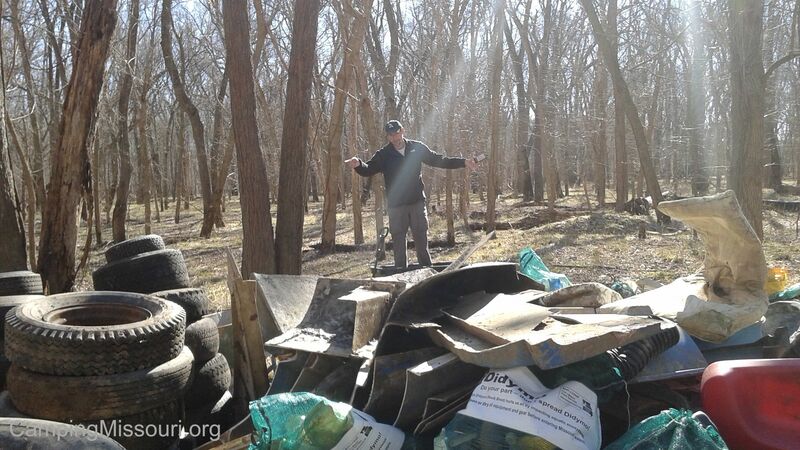 It was looking to be a really warm day for January, and our plan was to hike just less than a mile down toward the Meramec River, and start gathering all the garbage and debris that had come to rest in the floodplain along it. We would collect it in bags, pile up the tires and random other things, and then use wheelbarrows to bring it all to a central location, which the SNR staff would eventually collect on a day when the mud was frozen enough to drive trucks on. So after a bit of socializing, we gathered up our bags and beverages, carried our gloves in hand, and set off down the hill behind the Freund Center. It was a mildly slippery hike down the hill, to a steeper descent off the trail at the base and into the floodplain. Then we headed in the direction of the river; specifically a dried up slough that was the primary basin for where trash had accumulated over the years. 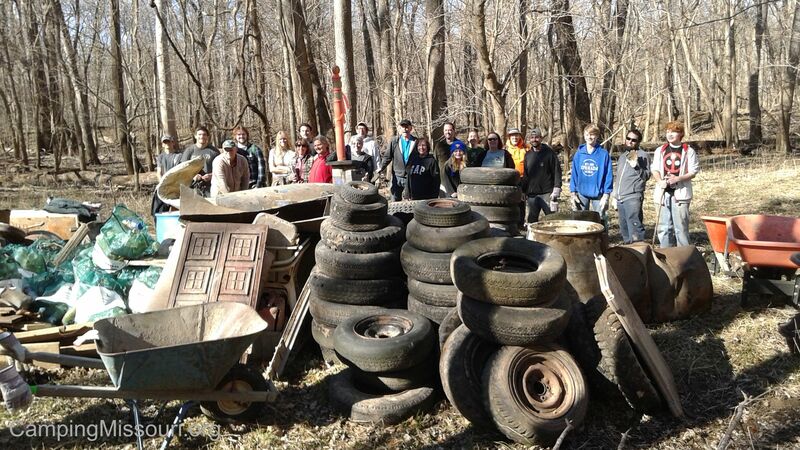 Among the goal of just cleaning up bottles and jars from floods gone past, there was also a boat, a couple of refrigerators, mostly-buried 50 gallon drums, and an array of tires (most of which had the heavy metal wheels still in them). 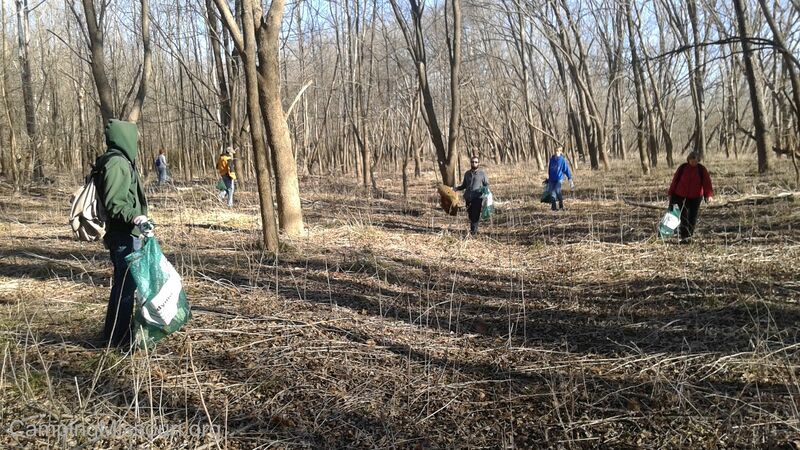 It was going to be a hard day but the air was cool and the sun was out, so as we closed in on our target area we donned our gloves and grabbed our mesh bags, and scattered in every direction to start cleaning up the garbage. 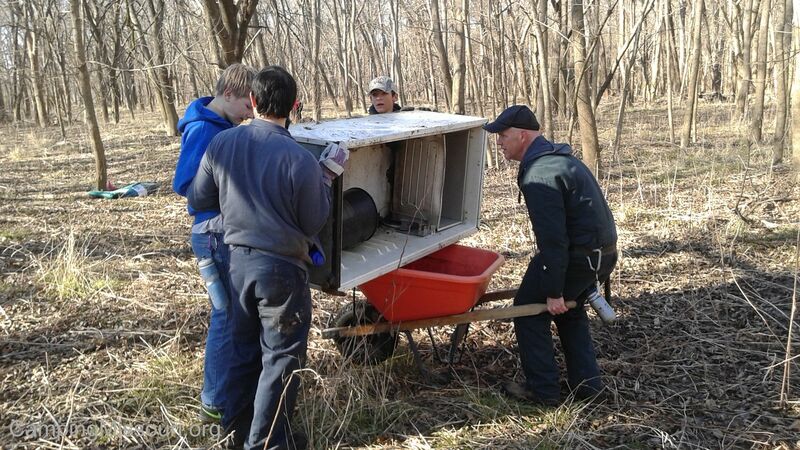 Doug never pushes a wheelbarrow across a floodplain without a fridge on it. Jay and Doug (two of the logistical taskmasters behind this grueling work) located the wheelbarrows that had been dropped off, so as we started to accumulate our filled mesh bags, tires, and random metal and plastic pieces of things abandoned long ago in various piles along the northern lip of the slough, they worked with some of the more youthful and physically resilient members of our group to load it all and transport it across the mud and sand and downed trees to the central “pick up” location. It was tireless work, and I was thankful to be focusing on the end that was just wandering around searching for trash and putting it in bags. The one time that I asked Doug if he wanted to take a break, and I would run a wheelbarrow trip, he looked at me with a grin and a determined fire in his eyes and refused any reprieve. A man on a mission, for sure. Dr. Bernie, preparing to operate on a boat. As the morning wore on and we successfully collected most of the trash we could find in the area, we started to focus more on the transporting of it to the main pile. 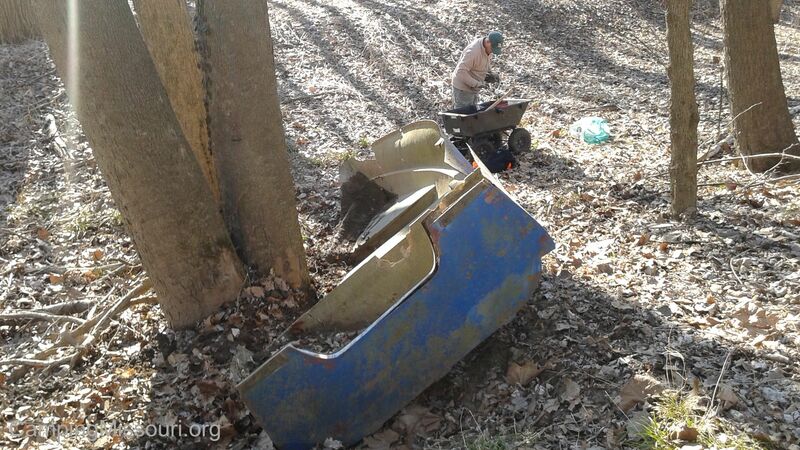 Bernie had chopped the abandoned and damaged boat into bite sized pieces, and was carting it off, so the rest of us started taking turns with the wheelbarrows, rolling larger tires, and dragging bags across the leaf litter as the mud was starting to warm considerably in the late morning sunlight. When we finally got everything we had harvested into the pile, we all breathed an exhausted sigh of relief and satisfaction, took some pictures, and then started to make our slow but triumphant way out of the river bottom and up the hill to the parking lot. A hardworking crew of Stream Team volunteers! This was just about one of the most physically exhausting cleanups that I have been a part of, and it was pretty notable how everyone had a positive nature about them, willingly taking on whatever feat of strength was asked with no complaints at all. It can be difficult and relatively thankless, but there was a worthy sense of accomplishment and pride among all the volunteers, as we wiped the sweat from our brows and looked upon our collected pile of bad choices, pulled from the dirt and sand of a quiet flood plain along the Meramec River in a somewhat never-seen area of the Shaw Nature Reserve. Thank you to all the volunteers that worked with us that day, and a special thank you to Besa and the staff of Shaw Nature Reserve. Without your permission, support, and coordination, we would not have accomplished such an impactful cleanup, and without your stewardship of the land, we wouldn’t have such a beautiful place to spend a Saturday morning. Jay, one of the orchestrators of this event! And I know this for sure, if a Stream Teamer calls you up and says “Hey, I’m going to go do this, and you ought to come along and help.”, your answer should be always be “Yes!”. Because no matter how hard the work may end up being, it will be done with joy and enthusiasm. Remember, many hands makes the heaviest of projects a shared weight, and we can make a heck of a difference when we all get out there and do the work together. 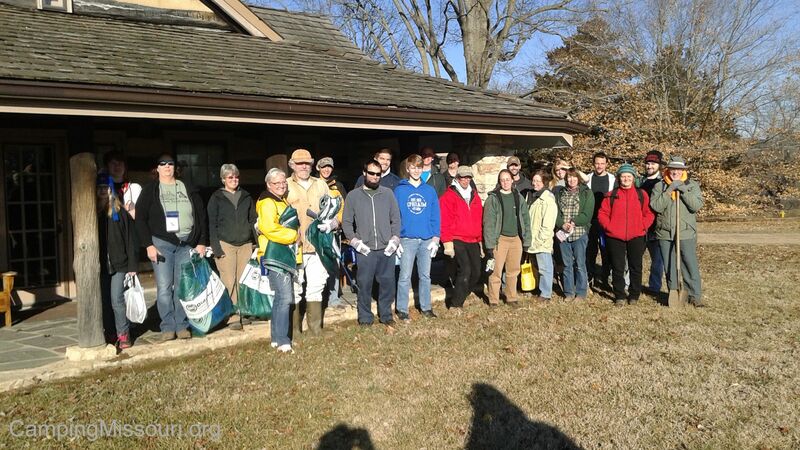 To get involved check out the Missouri Stream Team Calendar for upcoming Events! GREAT WORK! Everyone involved deserves a wheelbarrow full of good karma. I hike at the reserve and will be sure to visit the area you cleaned. I’m pretty sure I know where it is. Also, I noticed your photos are labeled and/or captioned. I suggested this in a reply sometime back. No matter what caused you to do it; please continue. You made a great suggestion, Marty! It certainly adds to the depth of the story, so thank you, Sir!